Cost Savings Tips for Weddings! Everyone knows that weddings can get expensive. From flowers, to finding the perfect wedding dress there are tons of expenses that come along with celebrating your special day. Here a few tips to help you keep the costs down while still having the day you have always dreamed of. Flowers- Flowers are a huge, often over looked, cost of many weddings. Order flowers from your local floral shop (our three recommended florists!) Or, if you are trying to stay within a certain budget-- try skipping floral center pieces all together, depending on your wedding it might be perfect to have an alternative to flowers such as candles! Our three-tiered candle lit centerpieces create a beautiful, elegant touch! Dress- Try a used wedding dress or borrow a wedding dress from someone in your family. Not only will it save on one of the biggest costs of the wedding, but it will also be a sentimental touch to walk down the aisle in a family members dress. If you don’t have that option, or are looking for something a little different try finding your dress at a discount bridal stores or trunk sale. Wedding Cake- The national average cost of a wedding cake is around $500. To save some money, try something other than a typical 3 tiered wedding cake. 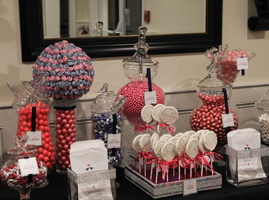 Serving cupcakes or having a candy station is a fun way to cut back on the cost of your typical wedding deserts. Hire a DJ- If you’re trying to keep costs down and deciding between a DJ and a band, often times a DJ is much less expensive. Another upside to choosing a DJ is the eclectic range of music you can play with a DJ. Get Crafty- Do it yourself décor is a fun way to add your own personal touch to your wedding and save some money in the process. Get creative and make your own signs or seating place cards to tie into the theme of your wedding. You could also go as far as making your own wedding favors for your guest to take home at the end of the night. Start early – If you’re not rushed to get everything you need, you will have time to shop around more, compare prices, and plan to hit big wedding sales. Starting early allows you to plan for any unseen financial costs that may arise. Miscellaneous – Miscellaneous cost can add up fast and are often over looked. One charge that often can be avoided is delivery charges. If you, or someone you know, are able to pick up items like the wedding cake, flowers, etc. you could be saving on the high cost of delivery charges. Use a Credit Card with Good Points- No matter how you slice the cake, while planning a wedding you will be charging a lot of expenses. It is important to take advantage of a credit card with good points, so you get the most for your money.